We're here to help whenever you need us. High quality products at amazing prices. You won't find cheaper prices anywhere! All stock held and dispatched from UK. We will not be beaten on. Maxstrength® Rollers are used to enhance balance, body awareness, muscle re-education and muscular flexibility and provide dynamic strengthening. Originally used to relieve muscular tension along the spine, hips, neck and shoulders, rollers are now widely used in Pilates and Physiotherapy to help to develop core stability through a range of exercises. 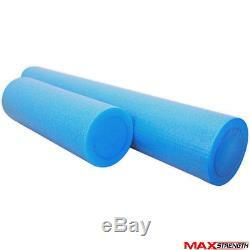 Foam rollers can be used in conjunction with resistance bands and Swiss balls. 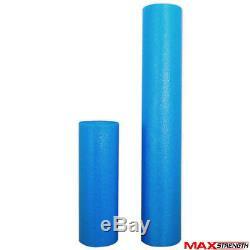 Roller Foam available in 90cm x 15cm and 45cm x 15cm (please choose from product options). Rollers are used to enhance balance, body awareness, provide dynamic strengthening etc. Rollers can be used in conjunction with resistance bands and Swiss balls. Available in Blue colour only. Brand New and Sealed Packaging. However, some remote mainland, N. And offshore postcodes have a mandatory surcharge from the carrier for few heavy or large items. Highland Postcodes: AB30-38, AB44-56, FK17-21, G83, IV (all), KW0-14, PH17-32, PH34-48 Aberdeenshire, Angus, Argyllshire, Ayrshire, Caithness, Highland, Inverness-shire, Perthshire, Ross-shire, Stirlingshire Offshore Postcodes: BT (all), HS1-9, IM (all) , KA27-28, KW15-99, PA20-99 , PH33, PH49-99, PO30-41, ZE (all) Northern Ireland, Republic of Ireland, Isle of Man, Isle of Wight, All Channel Islands, All Scottish Islands. Strength offers a complete guarantee. Welcome to Powerstar Ltd, The Company behind MaxStrength Power Star Ltd is one of the UK's leading suppliers of martial arts, fitness and weight lifting equipment. Powerstar is also one of the few sports equipment retailers with control over its own manufacturing units. Established since 1990, we have been successfully distributing our products to the UK, USA and Europe, earning popularity between our customers in the UK and across the world. We work very closely with gyms and boxing professionals to continuously develop our range products, and as a result we have developed Max Strength which have served the needs of boxing and fitness enthusiasts for nearly two decades. These core brands form a popular part of our wide range of products. Armed with our strong manufacturing capabilities, our products are sure to provide you an excellent balance of Quality and Price. We're rated 5/5 for service! All ready for fast dispatch. We're a UK based company dedicated to providing excellent quality products at unbeatable prices. Item arrived very quickly, as described and well packaged. A+++++++, spot on, thanks, will use again. 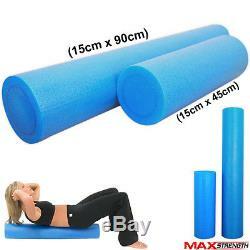 The item "Yoga Pilates Foam Roller Workout Exercise Fitness Gym 90cm x 15cm / 45cm x 15cm" is in sale since Friday, August 15, 2014. This item is in the category "Sporting Goods\Fitness, Running & Yoga\Equipment & Accessories\Exercise & Crash Mats". strength" and is located in Stockport, UK. This item can be shipped worldwide.